Randy Dotinga knows — probably better than anyone — the difficulties of transitioning into full-time freelance work. “I’ve been a full-time freelance writer since 1999. Before that, I was a daily newspaper reporter. It’s amazing that I’ve been doing this since 1999, considering that I’m only 25 years old,” he joked during a recent ProfNet #ConnectChat. In “Transitioning to Freelancing and Book Writing,” Dotinga covered the challenges of embarking upon a freelance career, the financial preparations that are important to make, time management and first steps. He also touched upon how an expert should approach writing a book for the first time and many other issues facing those who want a career as a freelance writer. 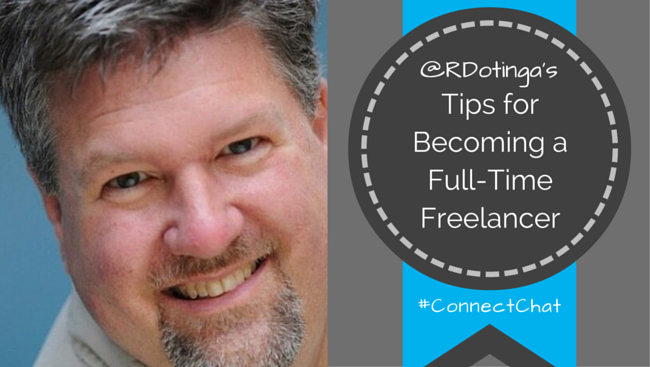 What is the most difficult part about transitioning to full-time freelance writing? Having to hustle in a very different way than you do in a newsroom. Personal connections are more important too. It can be difficult for writers who are used to a lot more structure and predictability. Is there something people making the transition should expect that they may not have thought about before? Be ready to keep track of finances in a whole new way. You are now a business and need to think like one regarding taxes, etc. How should one start preparing financially for the switch? Save money! Get your health insurance in order if you’re leaving a job. Understand how self-employment taxes work. An accountant can be helpful, although you may not need one, since you’ll be making quarterly tax payments. If you have a staff job, you pay taxes every paycheck. The IRS wants taxes over the year from self-employed types too! When you’re self-employed, you pay taxes quarterly. You estimate how much you owe and write a check to our pals at the IRS. Is a 100% switch necessary or can you adequately work as a freelancer while also pursuing other interests? You can definitely be a part-time freelancer, and lots of people do that. No need for full-time! What sort of business savvy do you need to be a freelancer? You need to always think about the money you’re making: Are you making enough per week, per month, per year? Know about business expenses and how to take every single one that you can: Conferences, books & magazines, your phone. Time management is very important – what advice do you have for those who may not have great time management skills? If you don’t have good time-management skills, set a firm schedule. 9-5 weekdays, maybe. Make yourself follow rules. Should you quit your job before starting or is building a base a better idea first? Definitely build a base! Use all the free time you have: Time before and after work, vacations, weekends. Some people don’t want to spend the time since they don’t want to be working all the time. Too bad. You have to do it. What advice can you give an individual leaving college and pursuing a career as a journalist? I’d suggest a staff job. You learn so much on the job that’s crucial for a journalism career! How can you make yourself stand out from so many other writers? Make editors’ lives easier: Have good pitches. Be reliable. File your stories on time. Be low on drama. What are some of the top mistakes that writers make when they try to transition into freelancing? Don’t forget the personal touch. 99% of my work has come because I knew someone or knew someone who knew someone. If you work in isolation & are constantly cold calling (or cold e-mailing) editors, it’s very tough to break out. It makes a big difference to an editor when you can drop a name in the subject line of an email pitch. You stand out. How do people transition from freelancing into book writing? One big tip: Learn how things work. Understand what a book proposal is. Don’t write the whole book first. Write about a topic you’ve already written about. Draw upon your existing work and save time. What sorts of journalists should NOT try for a freelance career? Those who aren’t flexible, who like things very planned-out and predictable. How do you make personal connections when you have a staff journalism job? Conferences are important to help you meet editors. But you can also use social media to meet editors and writers. Remember, it’s important to meet writers too. Other writers are often the source of tips about freelance gigs. I think there’s a misconception out there that freelancers don’t usually like to help other freelancers, perhaps due to fear of competition. What’s your perspective? True to an extent. But many successful freelancers are generous, and not just to be goody-goody. Connections=success. Also, freelancers can’t take every gig they hear about. We often refer editors to other writers. For example, you may get offered a story for Cat Fancy but you’re allergic to cats. You can pass it on. Is it possible to make a living as a freelancer? Yes! It’s an absolute myth that it’s impossible. We have members making 6 figures a year. Not everyone will succeed at freelancing. It’s hard work. But plenty of writers survive AND thrive. Are you a writer in need of experts? Send a ProfNet query. It’s easy and free! Just submit your request here: Send a query. Your website is useful. Maany thanks for sharing! Thanks Sasha! We’re happy you’re enjoying the site. yur post. They’re really convincing and wjll definitly work. them a bit ffrom next time? Thznks foor the post. submit is just nice and that i can suppose you are a professional on this subject. Nuestros Hungry Shark Evolution Trucos fue hecho para los jugadores como usted. Electricians normally needn’t work practically as exhausting as lots of the different tradesmen.